German-Canadian writer, author, human-rights activist, and a German patriot Ernst Zundel died on August 5, in Germany. Dr. Ingrid R. Zundel, a US citizen, said that her husband died on Saturday at his home in Black Forest in Germany where he was born in 1939. Ernest lived in Canada for decades. In 1984, a wealthy Israel-Canada dual citizen Sabina Citron, founder-president of Canadian Holocaust Remembrance Association, took Ernst Zundel to court for inciting hatred toward Jews on the basis of two documents; The West, War, and Islam and Did Six Million Really Die. At the conclusion of a vicious 7-week propaganda trial, the court pronounced Zundel announced innocent of inciting hatred toward Jews in his 4-page pamphlet, The west, War, and Islam, but was pronounced guilty of publishing – not written the anti-Holocaust book. In 1992, Canada’s Supreme Court acquitted Zundel on the ground that the law under which Zundel had been charged was unconstitutional. After spending some years in Canadian and American jails – Zundel was extradited to Germany where questioning the Six Million Died story is a serious crime. Germany, a vassal of Zionist entity jailed him for five years. Jewish historian and Auschwitz inmate Joseph Burg testified at Zundel trail claiming there were no gas chambers, was disowned by the organized Jewry. When Burg died in 2009, Zundel paid for his burial at a Catholic Cemetery as no Jewish site would take him. On May 7, 1995, Ernst Zundel’s Toronto home was set on fire, resulting in $400,000 damages. 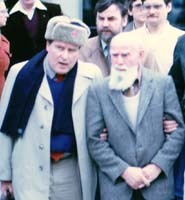 Zundel escaped as he was on a speaking tour. According to Jewish-owned newspaper, The Toronto Sun, the fire was set by members of the Jewish Defense League, which was designated as a terrorist organization by FBI in 2000. However, it still operates in Canada and France. A week later, JDL leader Irv Rubin was caught trying to enter Zundel’s property. Ernst Zundel, was a former member of Canada’s ruling Liberal Party. Professor George J. Michael (Westfield State University in Massachusetts), a Zionist ‘expert’ on White Supremacist movements (pro-Israel), and ‘militant Islam’ (anti-Israel) has claimed Ernst Zundel was “a neo-Nazi White Supremacist and an early figurehead in the fringe field of historical revisionism“. Listen to David Duke’s homage to Ernst Zundel below.